The Macintosh version of Encore 5 was released in early 2008, the Windows version of Encore 5was released in early 2009. 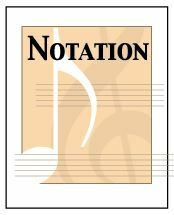 The MusicMXL XML file format provides a music notation interchange standard. It triumphs where NIFF (Notation Interchange File Format) failed. A significant part of it's success is its widespread adoption, making it today's de facto industry standard, and probably the standard for some time to come.